Click the "Add to Cart" buttons beneath available paintings to use your credit card with our secure Paypal shopping cart system. Acrylic on Illustration Board 16.5" x 12"
Print size 21" x 16.5"
Image size 19" x 14"
This painting was inspired from an old black and white photograph of her mother-in-law picking cotton with her brothers. Mary wanted to remind people that there is beauty in work, hard work was a way of life and children would help in the work, as they were a family. 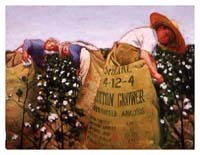 The sun shining on the cotton, the colors in the shadows of those working, the sacks used to put cotton in and the expressions on their faces help to tell a story. To think they never knew that one day this picture that was taken would be made into a painting to encourage others; to stir memories of the past. 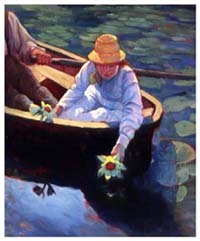 Mary chose vibrant colors because she saw so much life expressed in it. 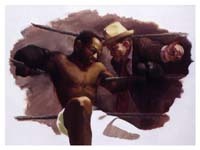 Print size 27.125" x 23"
Image size 25" x 21.5"
This painting was inspired from an old photograph taken at a train depot. There was a lot more in the photo but it was the girl with the dark eyes in the photo that caught Mary's attention. 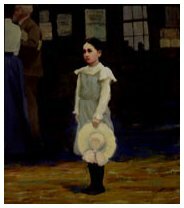 The painting was designed around the girl, standing alone, holding her hat and waiting. The people in the background and depot were painted in the shadow to draw attention to the girl. In the painting no one seems to notice the girl standing alone Mary leaves the rest of the story up to the viewer. 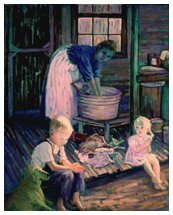 Print size 16" x 19"
In this painting a mother is washing the laundry on a washboard, glances at her son and sees him praying. His sister is placing her hands together as she sees her brother doing. Mary wanted to say many things in this painting, the training of our children to go to the Father in prayer at any time for any reason. We never know who is watching us as the sister sees her brother praying, so are we are light and salt in this world and as the mother has lived the truth before the children and then they live it before others. The light of God is seen in us and passed on. Mary chose cool colors to express the time of day early in the morning. She wanted the boy�s face to be seen as peace. This peace doesn�t depend on circumstances it is given to us through a relationship with God through Jesus Christ. 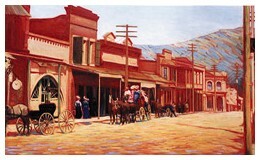 Print size 22" x 27.125"
Image size 20" x 24.5"
Mary painted this from an old photograph of Miner Street in Yreka, California in 1898. She wanted to express a hot summer day before before the time of the automobile. This was a time when the telegraph was the fastest communication. She used the library for her research. The pictures she took were of the buildings that still stand. She used new fronts and an imagination in creating this scene. Her goal was to make the picture come alive as if it were painted by someone who was there. 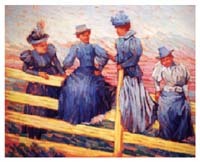 Her use of both color and strokes in her painting help to tell her story of the Miner Street of 1898. Oil on Canvas 19" x 22"
Mary chose to tone the canvas with a warm orange color allowing the colored canvas to show between strokes of paint giving vibrancy and movement to the painting. She kept the detail simple allowing room for the viewer to fill in the story. 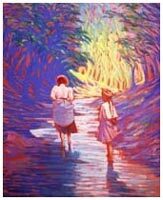 Her desire was to draw people into the friendship that developed between women in an era when life wasn�t complicated with progress and people made time for friendships to develop. Oil on Board 23" x 29"
Oil on Board 16" x 18"; Image 11"x 12"
Mary used a model to pose for this painting and with many small strokes of paint she painted character and strength into his face and hands. 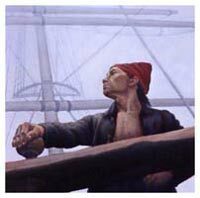 Mary wanted to paint the feeling of being out at sea. 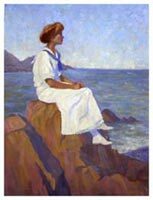 The memories of living by the ocean played a big part in the choices she made for this painting. Mary has a love for the ocean, the smell of the saltwater, the breeze and sound of the surf. The ocean waves that never end remind her of the power of God the creator of everything.